As you all know, we're busy celebrating the Olympic games around here (in our own way) and have been having a lot of fun doing it. Each time the games come 'round again I start looking for new picture books with which to introduce the world to my kids. Here are some new titles which we have been enjoying, courtesy of Candlewick Press. 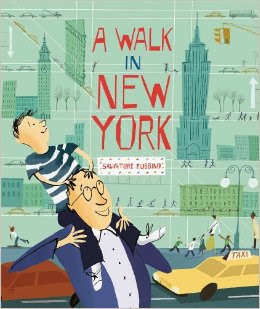 First up, there is A Walk in New York which was published in 2009. 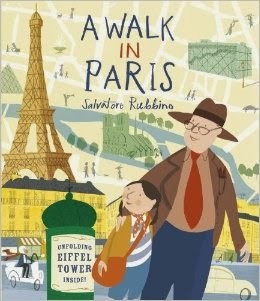 It is the first in a series of "Walk" books by Salvatore Rubbino. Just because we're spending the Olympics focusing on learning more about other countries, doesn't mean we should ignore our own! I had the pleasure (?) of going to New York City a few years back for the Book Expo (that part was a pleasure!) with Jennifer from 5 Minutes for Books. I cannot tell you, in all honesty, that New York City is my favorite place on earth. (See post for details.) However, it is filled with iconic landmarks and history that I think my children should be aware of and so we dived into this book. This story opens with a boy walking with his dad in Manhattan. They are surrounded by people because that is what you will be surrounded by if you ever go there. (I belong in the country. On a farm with no slugs.) The boy and his dad travel through Grand Central Station and explore various parts of the city, such as the library, the empire state building and, of course, the Statue of Liberty. The book failed, however, to mention Crumbs Cupcakes which are still one of my favorite aspects of my trip to NYC. Jennifer was very kind to take me there. Personally, I found it hilarious that when I came to the conclusion of the book and read the author bio on the book jacket I saw that Rubbino said of New York that it "proved to be the spectacle I have always imagined..." I burst out laughing. I think New York IS a spectacle. But to clarify, Rubbino goes on to say that it was a wonderful city. His opinion is higher than mine. (Again, if you'd just weed out the population and scatter them about to different locations so that there is room to walk and to breathe within the city then it would be better.) My kids are very curious about NYC. I will never take them there, personally. 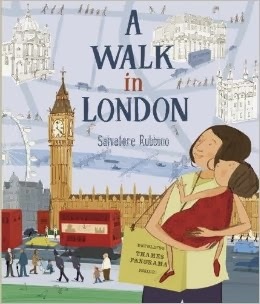 Back to our story, the girl and her mom get off a double-decker bus in Westminster and travel about by foot through St. James Park to Buckingham Palace. They go to Covert Garden Piazza, St. Paul's Cathedral, the Tower of London and many other amazing places. It is here I should mention that in each of these books there is a fold-out section of one notable thing from each city. In the case of London, you can fold out a panorama of the Thames. Also, each page offers a variety of "fast facts" so that you and the person reading with you can learn interesting tidbits that you might not otherwise know of each city. Paris (or France in general) is on our list of places we'd like to go to someday but it'll probably be awhile before we do. (England first!) I'm sure we'll consult this book a few times over in the coming years, as we celebrate these and future Olympic games and travel the world as we are able. Absolutely lovely series of books from Salvatore Rubbino! Highly recommended! Speaking of the next Olympics - they will be historical in that they are the first games to be held in South America! 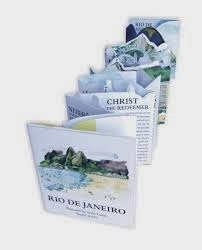 They will be held in Barra da Tijuca, Rio De Janeiro. 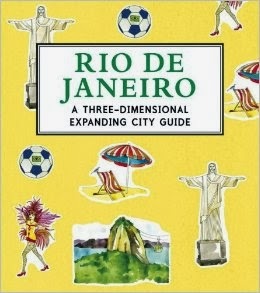 Candlewick Press has published Rio de Janeiro: 3D Keepsake Cityscape , illustrated by Trisha Krauss which shows off a view of the city. It's really quite cool! This will be released in May, 2014. We will look forward to those games as well but for the moment we'll focus on the winter games in Sochi. Fun times! Favorite Olympic moment so far? Do share! Any additional picture book titles to suggest as the games continue? I'm all ears! Many thanks to Candlewick Press for sending copies of all of the above titles my direction in order to facilitate this review. I have received no additional compensation and all opinions are 100% my own! That does look like a fun series--hoping our library has them! I've not been to NYC, but imagine I'd have a similar response as you. I have been to Paris several times (and even spent a summer there in college) and London twice. How exciting that you're planning a family trip to England! Fingers crossed the author will continue releasing these books. I'd love to see some other cities featured as well. I have enjoyed your blog by email for several years, and appreciate your Christian values a lot! Favorite Olympic moment so far? --- watching Noelle Pikus-Pace, sister of my husband's employee, after she completed the race that won her the silver in skeleton, jump several railings to get to her husband and children - she chose celebrating with her family over taking advantage of the photo ops, like each of the others had done. That says a lot to me about her values. Oh, and we spent 3 days in Sochi and Krasnaya Polyana with our daughter in 2006, just before we revisited her birth city, which is less than 200 miles from there.